As one might imagine, things were absolutely out of control. First things first: Kate Middleton has been spotted. I repeat: KATE MIDDLETON HAS BEEN SPOTTED. She was getting into a car, wearing a figured dress, white blazer and wedges, outside the Goring Hotel. Unfortunately, the press appear to know she's staying there, so we hope her windows are barricaded. Meanwhile, Harry's main squeeze Chelsy Davy was spotted shopping, and obviously it has to have been for the wedding. We know who designed the bridesmaid's dresses: Nicki Macfarlane. The stuff on her website's pretty, but then Pippa Middleton, Lady Louise Windsor, 7, the Hon. Margarita Armstrong-Jones, 8, and 3-year-olds Grace van Cutsem and Eliza Lopes will probably wear custom creations. Even though we have less than a day to wait, people are still speculating about the designer of The Gown. Now that Bruce Oldfield has admitted it's not him, people are all over the "narrowed field." Also, the fact that Kate's not going with him even though he was one of Diana's favorites! Here are all the remaining contenders. For what it's worth, Brad Goreski hopes it's McQueen. Does he have money on it? Bookies are apparently making bank on this question and every other connected to the RW. Also profiting: New York milliners. Apparently people here are buying up hats like crazy. To watch the wedding on TV? At 4 am? In snubbing news: nothing we didn't know, but Obama wasn't invited. Also, Tony Blair and Gordon Brown. They should apparently be even more offended because "a postman and cocktail lounge barman from Kate Middleton's hometown" are coming. But it sounds like she might actually know them. Oh, and Syria was disinvited due to bad international behavior. "I find it a bit embarrassing," says the ambassador. 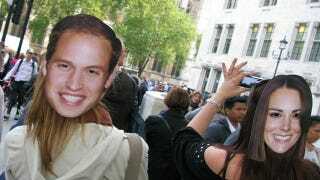 Someone who knew Kate on her gap year says she was set on "snaring" William and never stood a chance. Says "Yachtsman Cal Tomlinson," "Kate made no bones in telling us she was going to study at the University of St Andrews in Scotland and capturing the prince would be one of her goals." If only we'd known that was all it took! So: the wedding's not actually going to do anything to help England's economy. Also, the names William and Kate are no more popular than they were before the engagement of the century. And while we're at it, some people think the wedding won't even be fun. But! Kim Kardashian will be watching it. Who won't? No shocker here: Morrissey. Asked (why?) whether he'd be watching, Moz responded, "Why would I watch the wedding? I couldn't take any of that seriously... don't think the so-called Royal family speak for England now, and I don't think England needs them.I do seriously believe that they are benefit scroungers, nothing else...I don't believe they serve any purpose whatsoever. I'm not an anarchist, but I believe that people don't want the Royal family — the so-called Royal family. They're not royal to me, but they're royal to the media for some reason." Here is another Kate Middleton lookalike contest. Children can enter, too. These women look slightly like her. Well, they have brown hair. Because obviously you're going to need to know a ton of slang to comprehend the wedding service, here's a cheat-sheet. Oh, and wondering what to wear for a "street party?" Look no further. Apparently patriotic colors are de rigueur. And if you refuse to let anything not RW-related touch your person, well, apparently someone's doing a good line in wedding-themed cosmetics. And in the midst of all the excitement, the HuffPo's Marcy Blum reminds us to remember the day's real hero: the anonymous wedding-planner.